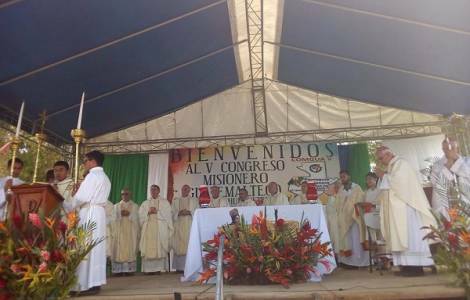 Huehuetenango (Agenzia Fides) - "The missionary enthusiasm in our hearts in these days commits us to actively participate in the transformation of our parishes. Let us go out from here with the firm intention of carrying out, in communion with all the living forces of our parishes, pastoral processes that are faithful to the Gospel, inserted in the multicultural reality of our country and open to what the Spirit of the Lord Jesus says to our Churches". This is a passage from the final Message addressed to the parish communities of Guatemala, disseminated at the end of the 5th National Missionary Congress of Guatemala (COMGUA V), celebrated from 16 to 18 November in the city of Huehuetenango. According to information sent to Agenzia Fides, more than a thousand people, mostly lay people, took part, along with Bishops, priests, men and women religious, from all the ecclesiastical circumscriptions of Guatemala. Marked by joy, celebration, prayer, thanksgiving to God and human and Christian commitment, the Congress aimed at "celebrating and strengthening the missionary pastoral processes in the particular Churches in Guatemala, through personal and ecclesial conversion to Jesus Christ, so that parishes may be communities of merciful communities, at the service of the Kingdom". The President of the Guatemalan Episcopal Conference, Mgr. Gonzálo de Villa, Bishop of Sololà-Chimaltenango, opened the works with a message in the name of the entire Episcopate, and presided over the Mass of conclusion, together with all the Bishops and numerous priests present. Mgr. Julio Cabrera, Bishop of Jalapa, President of the Episcopal Commission for the Missions, underlined that Guatemalan martyrs are also missionaries, and were present at the event, both those already beatified as well as those who are advancing the causes of beatification and canonization, including brother Santiago Miller. The works of the Congress took place in the premises of La Salle College of Huehuetenángo, that witnessed the martyrdom of one of its educators, Lasallian brother Santiago Miller, which took place on February 13, 1982, of whom Pope Francis recently authorized the beatification. The journey of preparation for the important ecclesial and national missionary event - is written in the final message sent to Fides - began in the Year of Mercy, with the discovery of the mission of being "merciful parishes like the Father", and from "an examination of parish conscience" in the light of Aparecida, which made becoming aware of "pastoral sins" and of the need for a permanent "pastoral conversion" possible. The Congress then analyzed the global situation of the reality of thousands of Guatemalans living in extreme poverty and social exclusion, since "we cannot carry out pastoral care without considering the contexts in which we live" and that these people largely live in the territories of our parishes. Some perspectives for the future were indicated, "to engage in the missionary and Samaritan transformation of our parishes".